Above: Erik Brandt, 2010. Postcard front (4×6) for MAPC 2010, set with Verena Gerlach’s Vielzweck font (available at primetype). 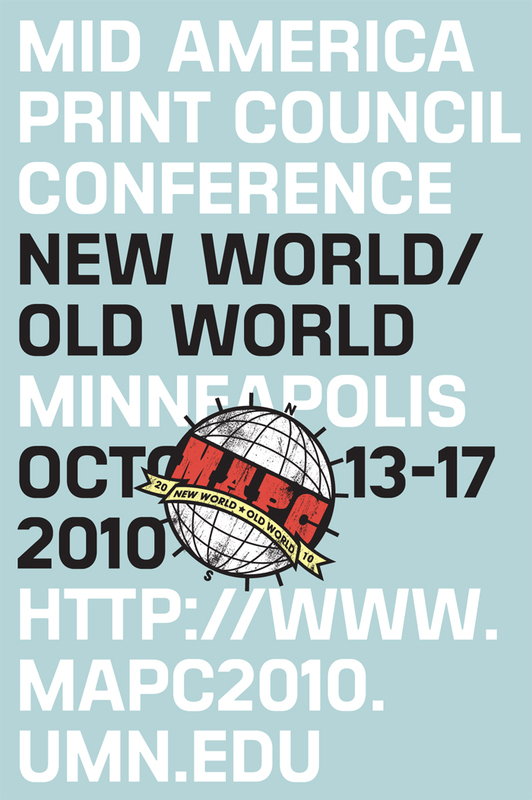 From October 13-16, Minneapolis plays host to the Mid-America Print Council Conference. MAPC 2010 is led by the fearless Jenny Schmid, of Bikini Press International fame and Professor of Printmaking at the University of Minnesota. This year’s conference is replete with fifty print exhibitions, lectures, and events, all beginning this Wednesday evening with openings in the West Bank and a kick-off party at Aesthetic Apparatus (see aforementioned Dead Wood post). Please visit the MAPC 2010 website for all relevant event information, including PDF downloads of exhibit times and locations (schedule page here). A map of the event sites is available here. Congratulations to Jenny and her many collaborators for their hard work, this promises to be an exciting event. This entry was posted by Erik Brandt on Monday, October 11th, 2010 at 10:09 AM	and is filed under Aktuell, Art, Color, Education, Geotypografika, Globalization, Graphic Design, Illustration, International, Internet, Minneapolis, News Links, Typografika, Typography.